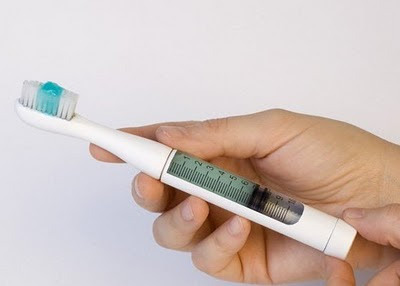 I'm something of a junkie for efficiency, especially when traveling, so it makes sense that this concept would appeal to me: Twist&Brush, from Kawamura Ganjavian, stores the toothpaste in the handle of a travel toothbrush. Simply twist the bottom like a stick of deodorant, and toothpaste oozes up through the bristles. Elegant, simple, compact - though I have no idea how well it would age, and cleaning the darn thing might be a pain. Still... want! In the same disguise-it-as-worthless category as the uglified bike and sandwich mold camouflage bags, this trick from Kevin Waits at Wisebread is simple but effective: hide valuables in your car in a fake "recycling" box, topped with cardboard and eggcrates. Is it a bit of an eyesore in a clean car? Maybe, but it's not as bad as having your stuff stolen! Let's hope not too many car breaker-inners are reading these blogs, huh? Many post-teen computer users may consider emoticons to be a scourge, a dumbing-down of the level of discourse, and a sure sign of the impending downfall of civilization. 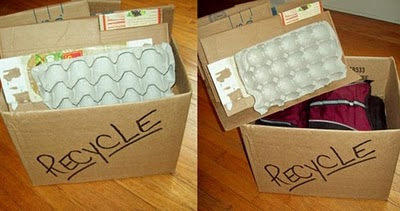 I'm tempted to agree - and yet, it turns out they may have some use. As Scott McDowell argues at The 99 Percent, "I've had to let go of my own perception that emoticons are silly. They may currently be our best tool for elevating the emotional clarity of digital messages." That's right, it's difficult to properly convey the non-text parts of human communication in emails and IMs - and those subtle cues are important. Instead of (dangerously) assuming that the reader will receive a message with the right emotional tone, a silly combo of punctuation marks can easily and usefully fill in those blanks. Who knew? Those crazy texting kids are on to something! Technology! It's here to solve all our problems - except when it's creating new ones. 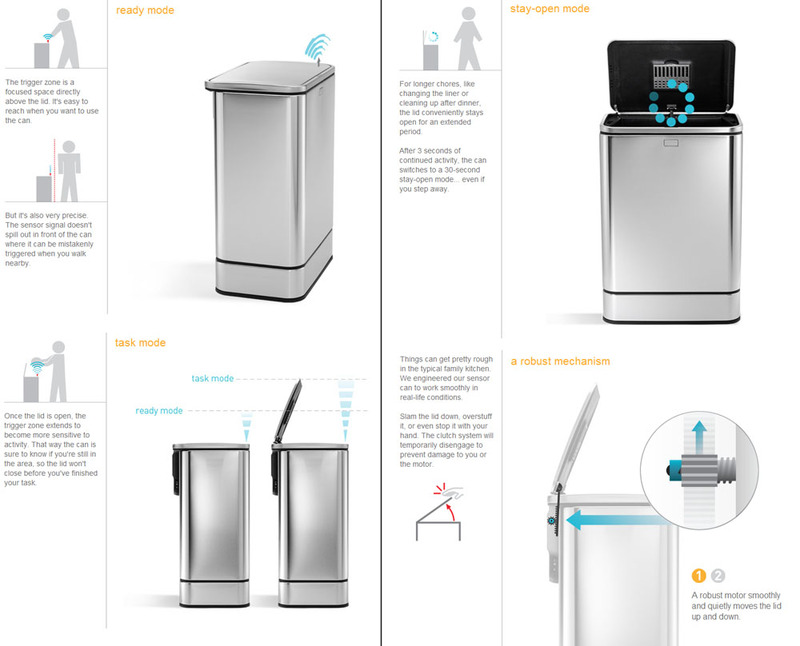 Exhibit A: the $225 electronic "multi-sense" trash can from a company somewhat-ironically called SimpleHuman. The image on this post is a summary of all the clever ways that the sensor interprets your actions, the different modes and functions, the safety and efficiency mechanisms. And yet, with all this, I'm almost sure that it won't perform as reliably or predictably as your standard foot-pedal model. Don't get me wrong, I'm a geek who loves to think about how to design automatic systems to do all kinds of things. But this, SimpleHuman, is too much even for me. Take it back a step - specifically, back to step-operated trash cans.